With the ringing of the bell, students are settling into their seats at the Horribilorum Sorcery Academy for Witty Witches and Wizards. Returning students are looking around and noticing that the old buildings have gotten a bit of an upgrade since last semester. Yes, it’s a good time to learn some new potions. Potion Explosion, the ingredient-collecting, potion creation game from CMON and Horrible Games puts players into the role of students creating potions in class. The game is getting a brand-new edition that includes a pre-assembled plastic dispenser. Potion Explosion 2nd Edition is 100% compatible with previous expansions such as The Fifth Ingredient and Game Night Kit. Players pick their ingredients (captured in round, glass baubles) from the dispenser, hoping for “explosions” when two of the same ingredients collide, allowing players to collect each of them from that grouping . They’ll use these ingredients, such as Ogre Mucus, Dragon Smoke, and Unicorn Tears in their potions in order to score points. Each potion also has a unique effect that a player can use (by drinking it, of course) once the potion has been completed. Potion Explosion: 2nd Edition introduces a pre-assembled plastic dispenser, allowing students to get right to their studies. The dispenser also has a drawer in the back, perfect for storing the ingredients in-between games. The game box’s insert has been redesigned to hold everything better between sessions. The hallowed halls of the Horribilorum Sorcery Academy for Witty Witches and Wizards occasionally need a bit of a facelift, but it’s still the same building that has taught students for hundreds of years. 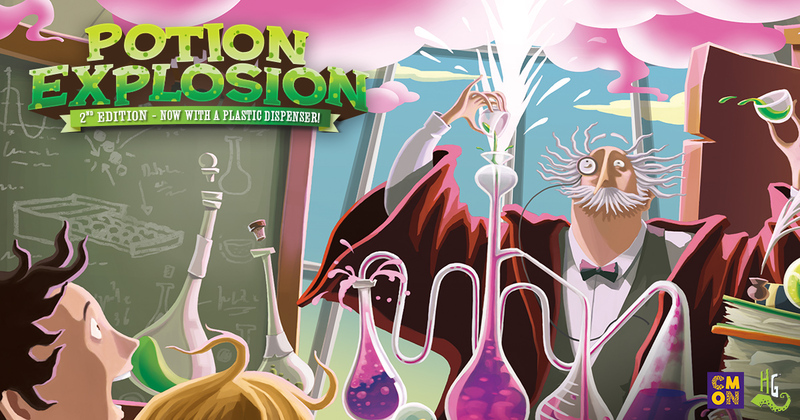 Just like it, the new edition of Potion Explosion is all the ingredient-grabbing action you love, but with a new dispenser. Potion Explosion Second Edition will be available in your FLGS on October 26. You can read more about Potion Explosion here.